LiveCode LessonsLiveCode LessonsHow to - LiveCode Marketplace Products Data Grid HelperHow Do I Create an iOS Date Picker in a column? 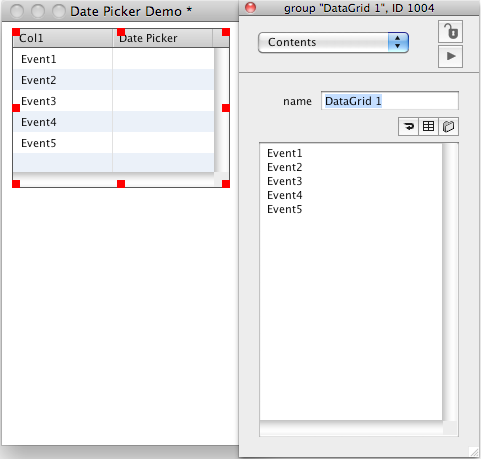 This Lesson presents how to create a column containing an iOS Date Picker control in a datagrid, using the Data Grid Helper Plugin. Click the (+) button and add two columns. Name the last column "DatePicker". Remove this field by selecting it's name in the Object List of the Column Content Area (2), after the field is selected in the Column Content, on your keyboard, press the Delete or Suppr key. Double clicking on the Date Picker field in the Column Content, will open the Properties Inspector. 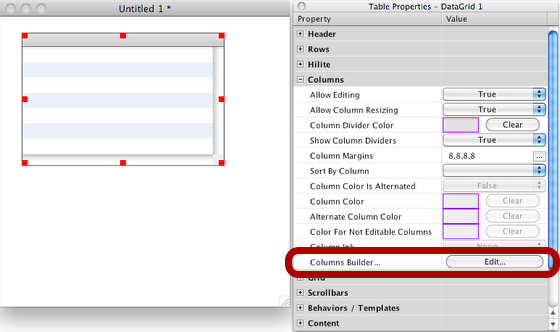 Close the inspector, then update the columns builder preview again by clicking on the update button. 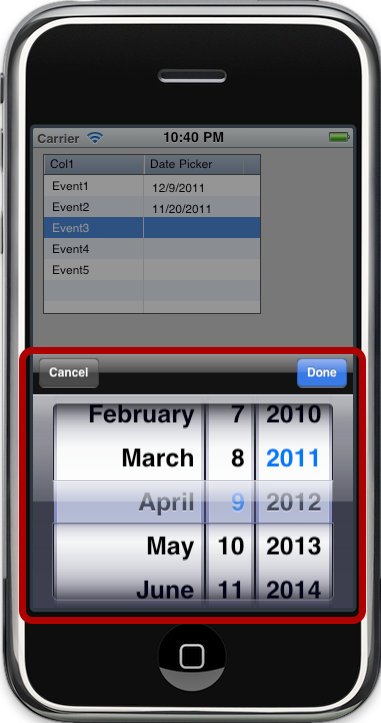 DGH can now build the required script for managing this iOS Date Picker according to the column data. Click the Script Editor icon and select the "Edit Script" menu. Default type for displaying the Date Picker type is added by DGH in the EditValue handler. The default type is "Date"
Once the date picker type changed, apply the script's change by clicking on the Apply button of the Script Editor. Before to test the result in the Simulator, add some data in the Col1 column by using the "Contents" topic of the LiveCode's Property Inspector. Separate data of each line by a return, then press enter to update the Datagrid's content. 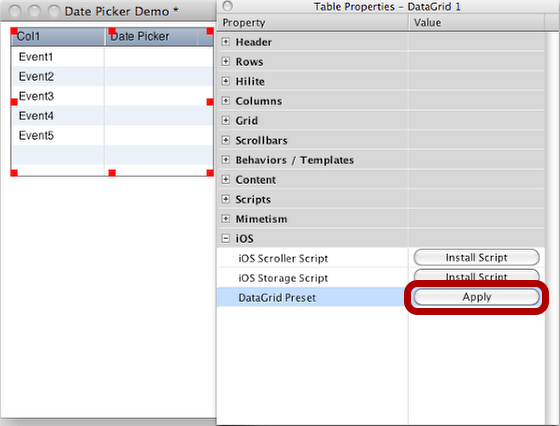 In the DGH's "Table properties", click on the DataGrid Preset's Apply button to change the datagrid appareance. To test the result, open the Simulator and click on the Date Picker column's content, then select a value in the Picker. Prev: How Do I Create an iOS Modal Pickwheel in a column? Next: How Do I Create a Progress Bar in a Column?